The grossly underappreciated builder Matt Mazian posted just two models in 2018, which is actually cause for celebration because it’s double his typical output for any given year since he started posting back in 2014. The deceptively simple Berlin class interceptor hits all the right notes for me, it has an unconventional design (at least in the middle), great striping and use of color. The misaligned arrow near the nose looks so much better than a perfect one would have and the pop of red on the engines is a tiny detail but it draws my eye every time I look at the image. I’m not entirely sure that the teal highlight color (or is it sand green?) is a legit lego color, but it’s a great choice. Still not sold? Maybe you think it’s too simple? Then I’ll resort to a little argumentum ad verecundiam for this model’s greatness. Maybe you’ll take the word of renowned builder and artist Pierre E Fieschi who commented “Awesome design! very original!!”. I should have just quoted Pierre to begin with and moved along. I can easily envision a wolf-pack of these interceptors preying on freighters or lumbering capital ships. Matt also produced the “Delta Shuttle” in 2018 and as much as I want to like it, I can’t quite get there. Maybe its too thick, maybe it’s too blocky…it looks like a failed attempt to capture a B2 bomber. I have puzzled over the model for quite some time trying to figure out it’s mystery, I get a weird feeling like I should like it but I can’t quite convince myself…like the music of bands like Arcade Fire, or Bon Iver. My esteem for the builder is high enough that I’m willing to puzzle over the models I don’t particularly endorse. I do like the engines, the ailerons and the clean lines, but the rest of it recalls a flying ziggurat, which isn’t necessarily a bad thing but it doesn’t quite get there for me. It probably says something about both the build and me that I spent so much time studying a model that I’m not really into, I’ll be very interested to read your comments on the design. I’m not sure if I’ll post again before the end of this terribly bipolar year, so I’ll take this opportunity to bid a less than fond farewell to 2018 and wish you constant readers the very best of luck and good health in 2019. My lego related resolutions for the new year are to build more (it won’t be difficult after producing only one model this year), write more and hopefully launch DA4 in late spring/early summer. For the remainder of the year, all well drinks at the Manifesto are half off, except for the Malort. Welcome back fight fans, to Sin City Nevada for another tooth-splintering edition of Friday Night Fights! This week’s bout is the battle of St. Astrid’s Fall, with heavy reinforcements and the blessings of the God Emperor on the line. Without further preamble, let’s go to the tale of the tape. Fighting out of the red corner, from the Forge World of Magnos Omicron, it’s Faber “The Magistrate of Mayhem” Mandragore and his “Blood Angels Captain In Terminator Armour”. And fighting out of the blue corner, from the Tomb World Seidon, it’s Marco “Mad Dog” Marozzi and his “Crusader“. It was a self-selected battle battle of the shipwrights, with at least a month’s worth of bragging rights and a dram of top-shelf whiskey on the line. In the end, Mark “The Machete” B. and his “JDS Asagiri (DD-151)” absolutely mollywhopped “Lock and Load” Locutus666 and his “JDS Asagiri DD-151“ to the tune of 9-1. Mark B. scores his first victory (1-0) while Locutus666 runs his record to (0-1). 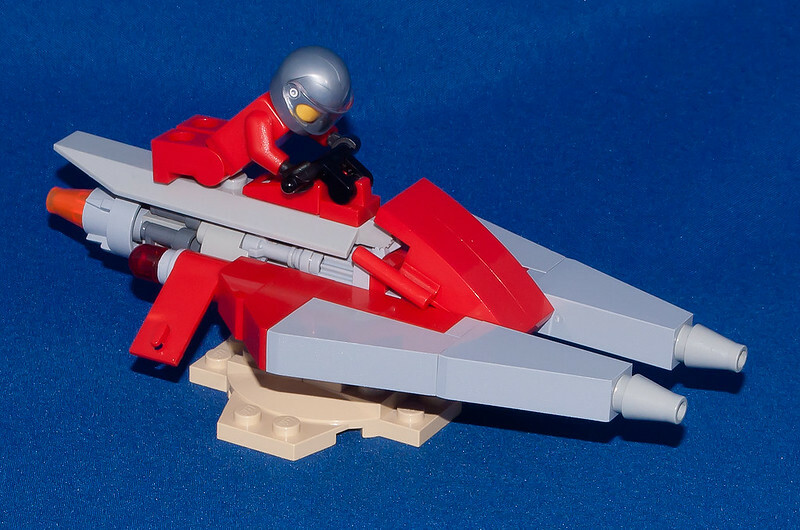 Another building contest hosted by the LEGO Speederbikes group on Flickr has come and gone, and the winners are now posted. It’s the second time that I’ve been involved with hosting the contest, and from my perspective it was another successful year. Last year’s contest was always going to be tough act to follow with 336 total entries. That said, the number of total entry photos still topped out at 268 (2nd highest ever amount). The 2018 contest still comes in 2nd place in both participants and entries. I was surprised that the number of participants was that high this year, based on the entry count and having a fairly similar format to last year’s contest (although it wasn’t required for “District 18” entrants to also enter the individual categories). It appears that a lot of people only entered 1 or 2 bike categories, and then bailed out on the “District” category. Perhaps a diorama was a little too ambitious for most people. Still, to those 34 people that still stepped up to the challenge we salute you! At the top of this list were the great critiques and collaboration that occurred from all around. It was good to see the community take another step-forward in bringing back “critique culture” to MOC sharing. We can’t thank Keith and Rutherford enough for spearheading that effort, and Werewolff, Hoffmann and the rest of the Manifesto readership who chimed in as well. Kudos to all. As a whole, I thought the speederbikes were built more compactly than in years past. There was a noticeable reduction in the number of entries that seemed way too big, or looked more like a hovercar. Many repeat contest participants also built their bikes smaller this time around. NPU continued to impress, especially with the larger variety of new parts that have come out year after year. Speed Champions, Mixel joints, and Constraction Fig panels FTW!!! Some speederbike silhouettes may have felt the same as in years past (“boiler-plate?”), but the ways they are getting constructed is getting further and further refined. There were so many impressive brick-built bikes, and impressive usage of the pre-fab bike chassis too. There was a lot of Nice Part Usage (NPU) this year, and called out by a lot of you in your comments and critiques. These pics below call out some NPU solutions that I am personally planning to “steal with pride” for my future MOC’s. I’m always a fan of spoiler part usages, so this paired configuration by GeekPerson naturally caught my eye. I’m sure I this configuration could come in handy. The use of 1×4 and 1×6 tiles also caught my attention… but I guess it would have been harder not to notice those big planks of plastic strapped to the sides of a speederbike. Using that part never crosses my mind when I’m building a speederbike … just like it never crosses my mind to get those soggy chickpeas and beets that are placed on salad bars. Who eats those? I guess as in all things it is a matter of personal taste, and these gents integrated them better than I would have imagined. For me, this category had 3 different speederbike building strategies fighting it out at the top; oOger building with large figure panels, Pico building up a motorcycle frame, and Guy Smiley building and shaping his bike with system parts. They all had thoughtful part placement, sticker placement, and image presentation. When oOger posted his bike, I felt that was the moment the “gauntlet was thrown down” in Enforce. Pico went back and swapped out his entry some time later, and I remembered thinking “I didn’t think anyone could catch up to oOger’s bike, but this classic Space Police bike is wicked!” Of course the final weekend always has some surprises in store, and Guy Smiley didn’t disappoint with his SWAT inspired speederbike. The only gripe was how dark that photo was. After adjusting my monitor a bit, I could see all of the wonderful details. Those white “hover pads” were delicious. oOger’s bike was in the top 3 for all four judges (no small feat), and that sealed his victory. Abide was by far the toughest category to judge, due to all of the diversity of designs and themes. Abide set itself up to be an “anything goes” category (that is, apart from added weaponry). There were two definite strategies at play; building bikes that were job specific, and those that were “everyday” bikes. Each of the judges’ final “Top-10” lists seemed equally split along those lines, so both approaches were appreciated. I was pleasantly surprised to see a water-world vibe from many entries… and speaking of water, those turd references were definitely sinkers and not floaters. 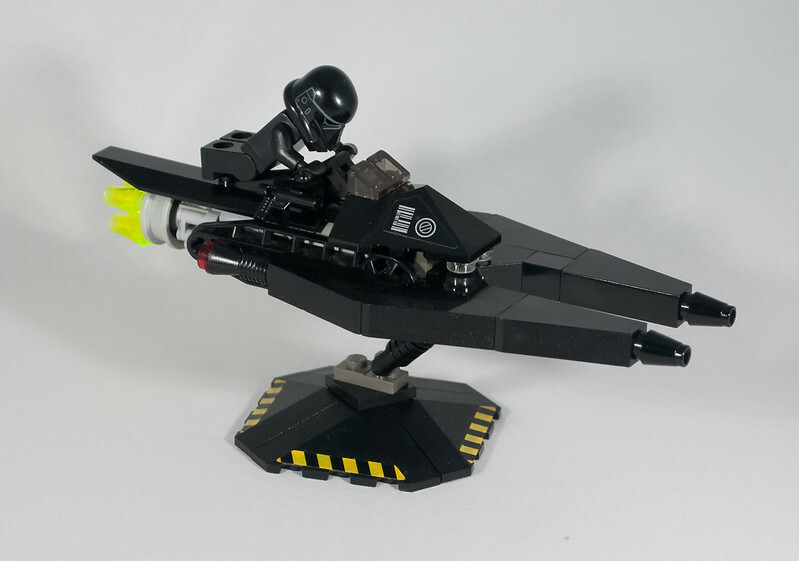 The original thought for creating the Rebel category was “wouldn’t it be cool to build some roving speederbike gangs?”, and that evolved into the whole “District 18” concept. That said, we still wanted to see anyone’s interpretations of the “Rebel” category beyond that initial “gangs” idea. Leading the pack were the bikes that were intimidators, and the bikes that represented the “larger than life” personalities of their riders. No matter the interpretation, Rebels want to be noticed (… it’s just that they don’t want to be caught). The districts were so much fun to take in, and very tough to judge. These are the thoughts that were going through my mind when judging the dioramas (and not in any order of priority or weighting). Were the speederbikes clearly the focus of the action? Were they easy to see? If any District scored lower than expected, it was likely due to missing the mark a little on one of those areas. On the other hand, overcompensation in one category could also carry a District higher up the rankings. It wasn’t an easy decision. All of the entries we were impressive, considering that the contest entry period only ran for 33 days. We knew that was going to be a challenge for many, with both time and available parts supply, and why we decided to allow digital entries. Not too many people took advantage of that, but it was still good to see that there were digital entries posted in all categories. In the end, including digital entries really felt like a non-issue. For me the story of “District 18” was one of unrealized potential. There was so much anticipation based on the bikes people already posted, only for their dioramas to never materialize. Felipe Avelar came out of the gates very strong, teasing us all with a tempting array of speederbikes just waiting to be swooshed. I thought for certain we would see something from him in the “District 18” category, but it never came to pass. Perhaps his daughter was having too much fun playing with them, and he didn’t have the heart to take them away. I really wanted to see one from LEGO 7, based on his aquatic themes speederbikes (like his Lantern Taxi that I’ve already linked). I think combining his speederbikes into Shmail’s apocalyptic water-world could have made a winning combo. Klikstyle had some spectacular vignettes that I thought for sure were building up to becoming a district. Per_ig delivered some speederbikes that could have been right out of a colorful version of the Ma.K universe. Spac13 had me thinking that he might deliver on a Jurassic World diorama. My mission statement for the contest, if forced to write one, would have been “to inspire lots of people to build cool things, and have fun doing it”. The number of participants indicated that we did inspire lots of people to build once again. I know that the contest also delivered on the “build cool things” part of the mission too. I hope it was enjoyable for both the participants and spectators alike, but that is not for me to decide. What I enjoyed most was whenever someone was told that their entries were their “best MOC yet!” Contests are at their best when they can be the unexpected spark for a person to build something new, as well as a pushing them into building something they wouldn’t otherwise have considered. I’m glad that the contest could be the catalyst for many such builds this year. Keep on building!